Zelacom is an internet development company with nearly two decades of experience and a unique perspective of where media, technology and business meet. Based in the Mid-Hudson Valley in Ellenville, NY — yet close to the New York City area — Zelacom creates custom web, software & application solutions for businesses across the street and across the country. Our partners and staff have varied backgrounds and experience in health care, insurance, real estate, publishing, local government, fine art, retail — even animal husbandry — all of which contributes to the diverse sensibility we bring to our work. Zelacom creates software that is natural and flowing. Our expertly designed workflow tools are easy to use by non-technical people. We excel at taking inefficient legacy business processes and streamlining them into simple, robust, scalable applications to meet your needs. To complement the efficiency under the hood, we design user interfaces and websites that please the eye and mind. We can find solutions for any budget, and have created many for under $5K. 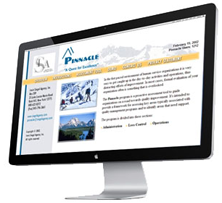 We can also provide custom, SEO-friendly writing, photography, logo design, or just advice. Zelacom likes to keep it all in-house. We provide managed and unmanaged web and email hosting on our servers in California and New York. All our hosting plans come with basic site maintenance included, so if you need a quick edit or addition, we take care of it free of charge.